Newish form Aldi are their own branded version of Nakd Fruit Bars made from “100% Raw Ingredients”, cold pressed and “high in Fibre”. They are approx. 9cm long, 2.5 cm wide and almost 1cm thick. This version is the Blackcurrant one and instantly you get a sharp cheek tingling berry blast similar to those sharp type of homemade blackcurrant jams that you sometimes buy. Its unmissably blackcurrant, but there is a background of mushed raisin flavour, but the sharpness of the blackcurrant renders most other flavours obsolete, it does make it juicy though. 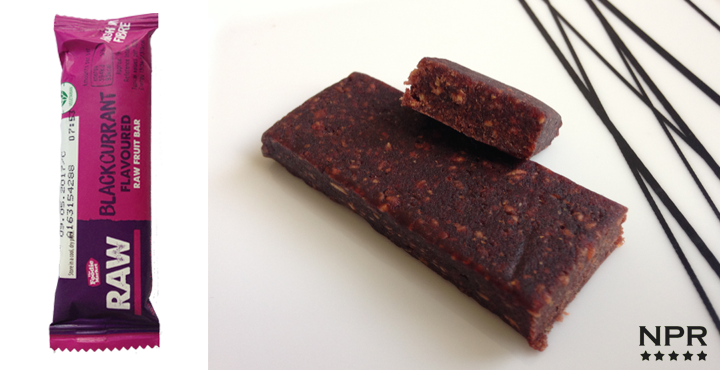 As for the texture, it’s very soft, not like the tougher fruit bars on the market and feels like and tastes like a natural blackcurrant soft chewy sweet. There are a few little bits of pit or shell or whatever it is that annoyingly gets left in your mouth afterwards. Its quite a small bar as it is and because it is very soft, it gets swallowed up quite quickly without much chewing so I feel like its gone in a flash without hitting the sides. Overall, its a bit too sharp for my liking, too sharp for getting any enjoyment out of it and a bit too small to fill up any urges but I guess as a natural energy shot it might just do the trick.